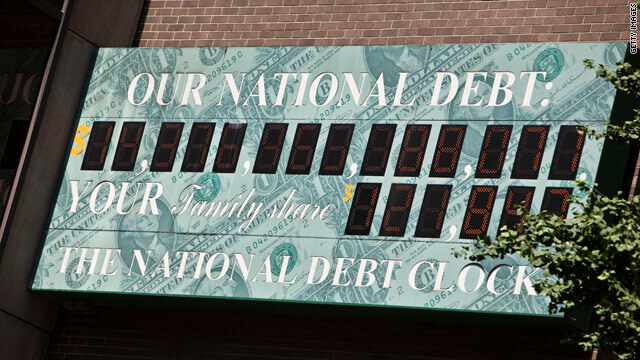 Billboard featuring U.S. debt clock on July 11, 2011. Polls: Should any debt ceiling agreement include tax increases? Washington (CNN) - Tax increases are one of the biggest sticking points in contentious negotiations to try and raise the nation's debt ceiling. But do Americans agree with the position of congressional Republicans that any deal should not include tax increases? Two new polls are gauging Americans' opinions. A Quinnipiac University survey indicates that two-thirds of the public say an agreement to raise the debt limit should include tax hikes for wealthy Americans and corporations, not just spending cuts. The poll's Thursday release comes as the president and top congressional leaders from both parties get ready to meet at the White House for a fifth straight day to try and head off a possible federal government default. Administration officials have warned that a failure to raise the current $14.3 trillion debt ceiling by August 2 could trigger a partial government default. If Washington lacks the money to pay its bills, interest rates could skyrocket and the value of the dollar could decline, among other things. Opposition by GOP lawmakers to tax increases is a contributing factor for the lack of agreement. But the poll indicates that 67 percent of voters questioned say that an any agreement to raise the debt ceiling should include tax hikes for the wealthy and corporations as well as cuts in spending. As expected, there's a partisan divide on that question, with Democrats by an 87 to 7 percent margin and independents by at 66 to 26 percent margin saying that tax increases for the wealthy and corporations should be included. But by 48 to 43 percent plurality, Republicans disagree that taxes should be included. A Gallup poll released Wednesday asks the question in a different way. According to the Gallup survey, 50 percent of Americans say an agreement on raising the debt ceiling should be done only or mostly with spending cuts, with 32 percent saying the agreement should equally include spending cuts and tax increases, and 11 percent saying the agreement should be completed only or mostly with tax increases. The poll indicates a partisan divide, with 67 percent of Republicans, but only one third of Democrats, saying the deal should include only or mostly spending cuts. The Quinnipiac survey indicates that more Americans would blame congressional Republicans rather than the Obama administration if the nation's debt ceiling is not raised. According to the poll, almost half of voters say congressional Republicans would be mainly responsible if there's no agreement, with 34 percent saying the Obama administration would be most at blame. By at 49 to 33 percent margin, independent voters would blame the GOP more than the administration. As for an agreement, both polls suggest Americans aren't sold yet on the need to raise the debt ceiling. According to Gallup numbers released Tuesday, 42 percent say want their member of Congress to vote against raising the level, with 22 percent saying they want their lawmaker to voter in favor of lifting the ceiling and 35 percent not sure. The Quinnipiac survey indicates that Americans are split, with 45 percent saying that not raising the debt limit would force the government into default and hurt the nation's economy, and 43 percent saying that lifting the ceiling would lead to higher government spending and make the national debt larger. The Quinnipiac University poll was conducted July 5-11, with 2,311 registered voters nationwide questioned by telephone. The survey's overall sampling error is plus or minus two percentage points. The Gallup poll was conducted July 7-10, with 1,016 national adults questioned by telephone. The survey's overall sampling error is plus or minus four percentage points. Republicans have done an absolutely stellar job of selling the idea of letting the Bush Tax Cuts expire amounts to a tax hike. Don't forget that GWB himself promised the nation from the Oval Office that these controversial cuts would be only be "temporary." When you own a store and you lower the price on something for a week, it's a temporary price/rate reduction. When the sale is over and you restore the original price, that is not a price hike. That's called the end of the sale. This is yet another example of Republican broken promises, lies and deception to the American people. It was always their intent to make the cuts permanent, despite the fact that instituting them set us on a path of massive annual deficits. To close the loop on their deception, they blame Democrats for wanting to raise taxes. Republicans will let the country crash before they make millionaire's private jets depreciate over 5 years rather than 3. Poser said "Of course we should raise taxes. Taxes as a percentage of GDP are at their lowest point in over 40 years." The tax revenues are that low because we have record long term unemployment. When people are working, the govt collects taxes from them and the businesses who employ them. During the Bush years after the recession of 2000 and 9/11 and despite two wars and tax cuts for everyone, the govt was collecting record revenues. The deficit in 2007 was only 1.7 billion,1/10th of Obama's deficit projected for 2011 (final deficit for 2008? 500 billion BTW). The meltdown in 2008 obviously caused major diruptions in the economy but that was 2/12 years ago. You can't continue to blame Bush, the causes for the meltdown was a long time coming and had plenty if bi-partisan fingerprints on it. Agreed (with most). Everyone should contribute taxes, even the poorest. But, dont sacrafice the already weak recovery for the sake of ideology. Do what is right, get a deal done. Worry about your base and re-election later. Politicians in both parties will certainly feel the wrath of the voters if the economy slides into another massive recession. It is UN-AMERICAN for the wealthy to say he'll no WE WON'T HELP the American economy. We are greedy AND only care about us, and no one else. A lot of you conservatives (terry,va, etc. ), upset that almost half of working Americans don't pay taxes, should realize that w changed the tax code to allow that, not Obama. Many liberals favor returning to the Clinton era tax code, FOR ALL. Get it?? Everyone making much money at all pays something? I personally think the Earned Income Tax credit (AKA: Lifetime Unachievement Award) should be reined in and severely limited. ABC News just said Americans want a mix of cuts and more taxes- why can't Congress understand that we are logical people and not the extremist they tend to listen to? Actually the "47% who pay no taxes" pay a lot more taxes than the rich as a percentage of their income when you factor in state, local, sales, cigarette and alcohol, liscencing fees, property tax, payroll tax, etc. I say we make the rich pay the same percentage of their income in these taxes as the poor. And tax capital gains the same as income. That would be fair, right?